This recipe yields about. 35 squares of truffles depending on their size and should be made over a period two days, if you have time. Heat the cream and butter to a boil and remove the pan from the heat, break the chocolate into pieces and add to the hot mixture. Stir until the chocolate has melted and add flavoring. Pour the truffle into a shallow pan (the truffle should be about 1 cm thick), cover and set it cold overnight. 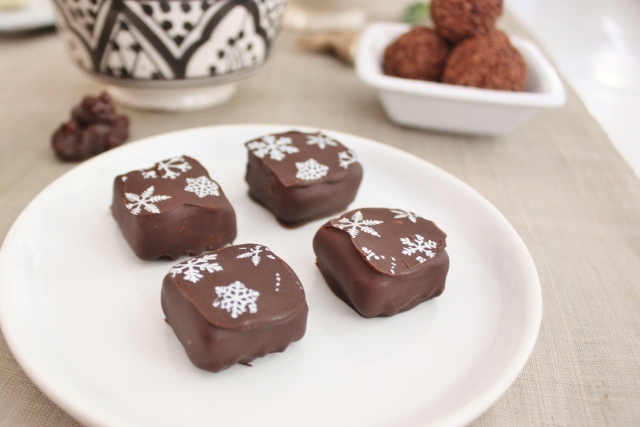 Cut the truffles into pieces approximately 2×2 cm pieces and freeze for a few hours before you cover them with chocolate. Heat the chocolate over a double boiler and make sure it is not more than 40 degrees, remember that chocolate melts at body temperature. If the chocolate is to hot the it gets grainy and quickly discolors. Temper the chocolate so so that it restructures it self and get the proper snap again. When the chocolate is ready, take a few of the truffles out of the freezer a few at the time and dip them in the melted chocolate. Place a piece of foil with chocolate print and let the chocolate harden, when the chocolate is hard, take the foil off and the print will remain on the pieces. Your choice of chocolate is important, the better the chocolate, the better the truffle. Thank you for liking this post, hope you will like the them if yoou try to make them.